New Upgrades Coming Soon! 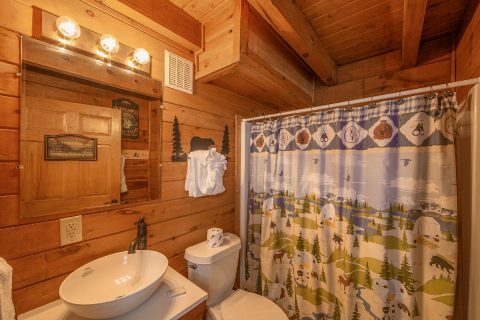 Stay tuned for new photos that will show improvements and new amenities in this lovely cabin! Your pet friendly cabin in the Smoky Mountains, "Moose Lake Lodge," provides vacationers with a 1-bedroom log cabin rental near Tanger Outlet Mall and exhilarating Pigeon Forge, TN. Guests can enjoy quick easy access to the area’s major outlet shopping center and dozens of nearby attractions without ever being too far away to check on the family pet. 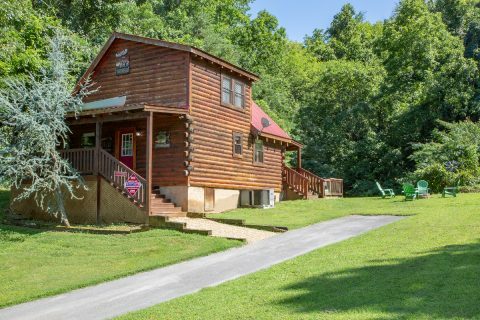 This dog-friendly cabin in the Smoky Mountains allows the entire family to enjoy a vacation together. 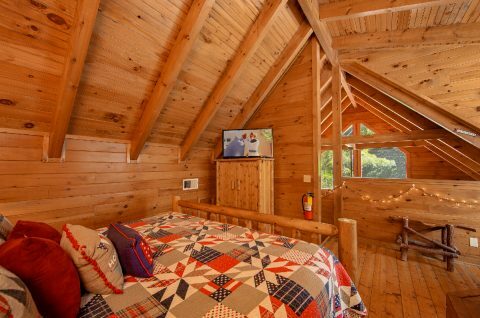 Aside from "Moose Lake Lodge’s" great location, there are other great features about this pet-friendly cabin in the Smoky Mountains that easily accommodates up to 4 guests. 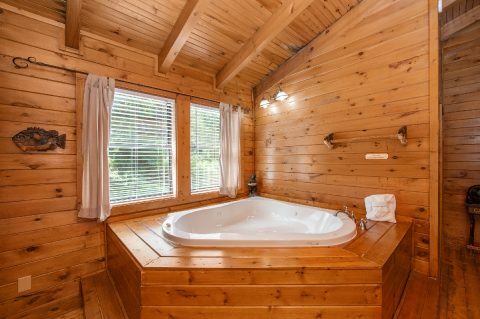 Try your hand at fishing the community's fishpond and later relax in the hot tub's warm waters, as you overlook the sun setting over the pond. 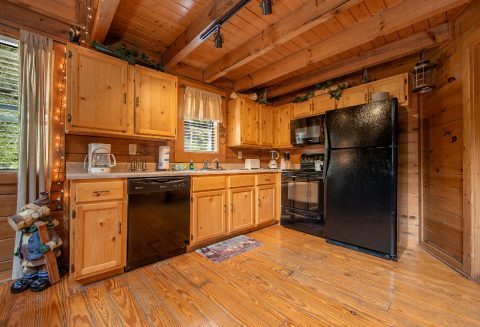 Evenings are a great opportunity for the family to gather on the large deck or in the dining room to discuss the next day's adventures over dinner cooked on the gas grill or in the cabin’s fully equipped kitchen. 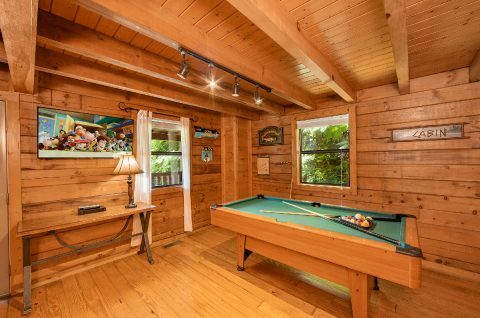 After dinner, gather in the cabin game room to hold a family tournament on the pool table. 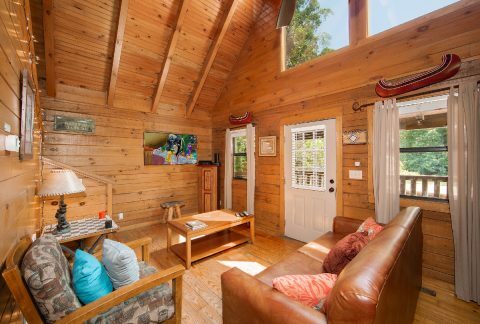 The living room offers a 50" television, so it's the perfect place for enjoying a fun movie night. 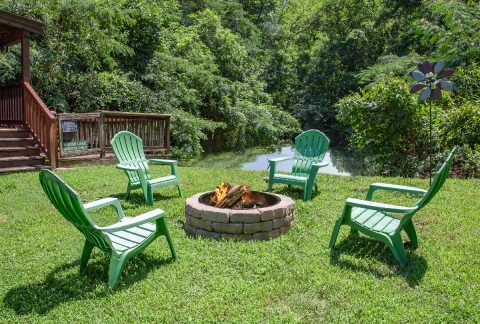 Your cabin even provides an outdoor fire pit, so you can enjoy an evening of making s'mores and star-gazing in the Smokies during your getaway! 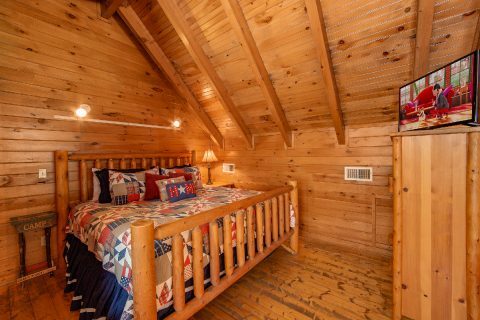 This dog-friendly cabin in the Smoky Mountains offers a master suite that features a king-size, 4-post log bed, jacuzzi tub, and personal television, providing the perfect space to pamper yourself. For accommodating extra guests, a sleeper sofa is provided in the living room. 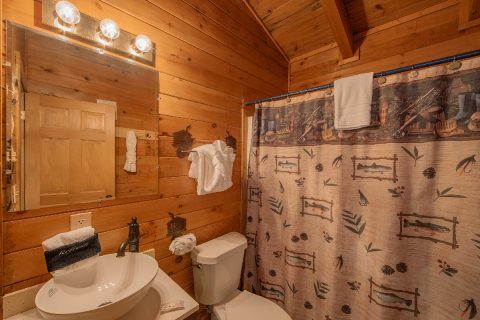 "Moose Lake Lodge" is a great start to an unforgettable family vacation. 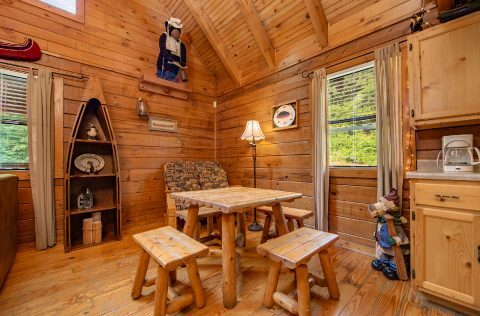 Book your pet friendly cabin in the Smoky Mountains ONLINE with Cabins USA Gatlinburg to get immediate SAVINGS!